Another thing I want to point out is the thickness of the fabric in question. The fabric on the top example appears thinner than the fabric in the lower example. Take note of both collars. On the top, the circular rim of the collar connects directly to the rest of the collar, while on the bottom, there is a space between the circular rim and the vertical part. The same applies to the edges of the cape. While on the top example, the edge is crisp and thin, on the bottom example there is extra space between the rim and the rest of the cape. This extra space makes the clothing look more thick and heavy. 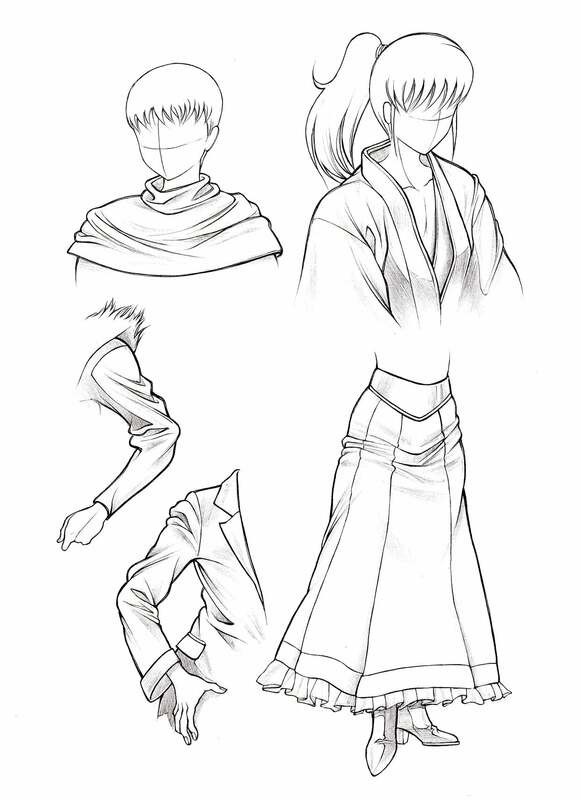 Now that we know a few of the basic shapes of folds in fabric, let's move on and see how clothing should look when it is actually being worn by someone. 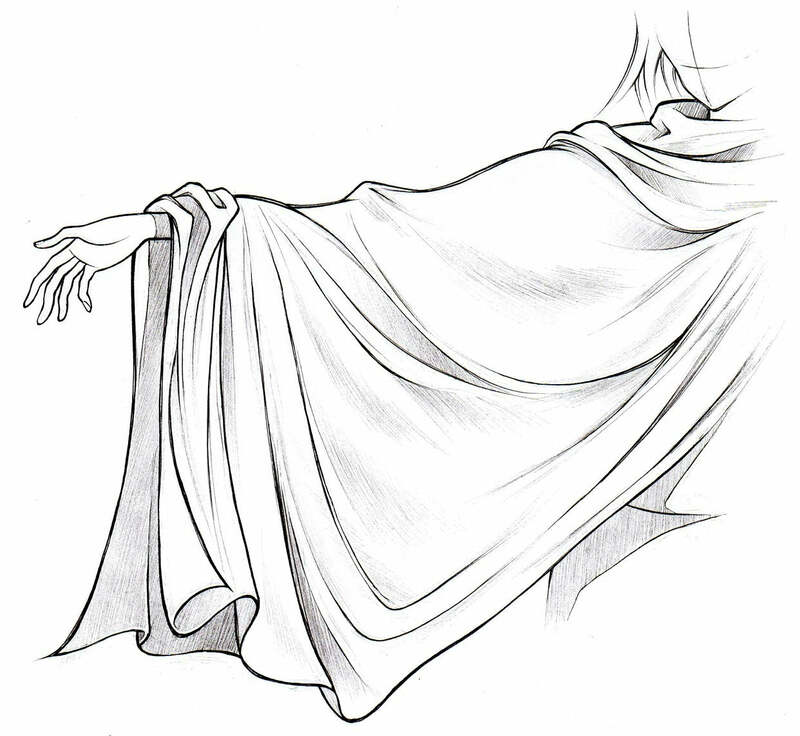 At the left, we have an example of a very loose, draping sleeve. As mentioned before, the main thing to consider is which direction the fabric will be pulled. The sleeve here is being pulled in two main directions: downwards because it's pulled by gravity, and to the left because its attached to the main garment and is being stretched across the arm and torso. The folds in the sleeve will follow the direction that the cloth is being pulled. Notice also how the cloth bunches up around the wrist. This isn't necessary, but it does indicate the length and looseness of the sleeve. Here are three more sleeve examples. These sleeves are not as loose as the one shown above, and all stick pretty close to the arm. 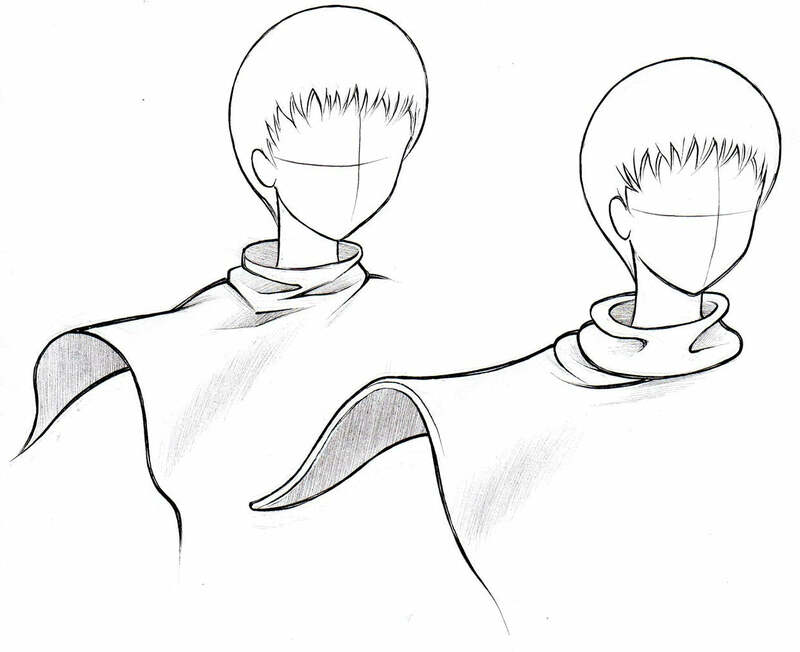 In these examples, the cloth is stretched from the arm to the shoulder and torso, rather than being pulled down mainly by gravity. There isn't enough material to be pulled down too greatly. Since the fabric is pulled horizontally, the folds should reflect this. 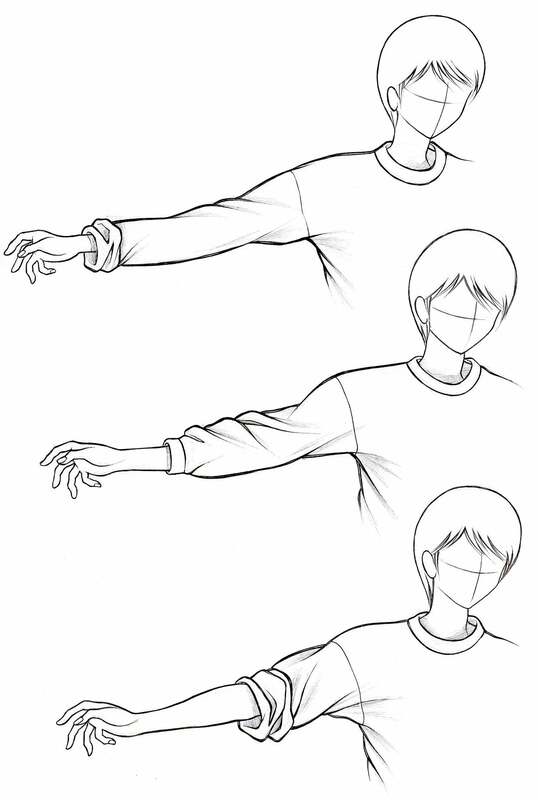 The best example is the top picture here; notice how the folds move towards the shoulder instead of towards the ground. The sleeve in the middle picture is a little looser, and is pulled down by gravity more. The sleeve in bottom picture is big and loose, but is rolled up at the elbows, and thus doesn't hang and droop as much as the sleeve in the previous example. These are some miscellaneous bits of clothing that didn't fit into any of the other sections of this tutorial, but that I wanted to include anyway. In all these examples, try to identify where the cloth is being pulled towards and in what direction (for example, is it being pulled roughly towards the shoulder, or draping loosely over the subject?). Always remember to shade wherever the light doesn't fall, such as grooves, areas inside the folds, and places where the cloth overlaps. One small but important thing I would also like to go over before continuing is the effect that stripes can have. 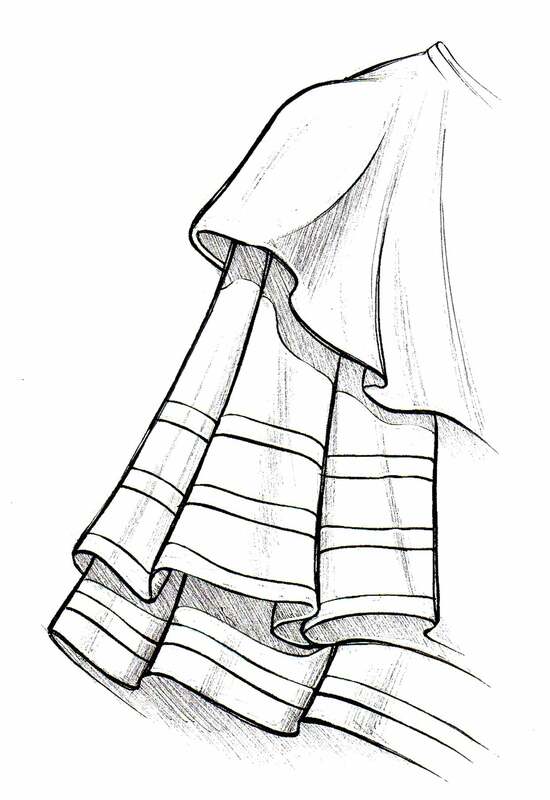 If you are drawing clothing that has stripes or a pattern on it, make sure that the pattern moves along with the rest of the fabric. Where the cloth bends, the stripes and patterns will bend, as well. This can be difficult to draw and shade, especially when you are dealing with complex patterns, but it can add a really nice three dimensional look to your picture.